The newly, redesigned Buck Open Season® Avid Series combines all the right tools for a successful season. Made from quality materials, the whole series is offered with a 420HC steel blade and contoured red wood handles. Features include a drop point, 4. The newly, redesigned Buck Open Season® Avid Series combines all the right tools for a successful season. Made from quality materials, the whole series is offered with a 420HC steel blade and contoured red wood handles. 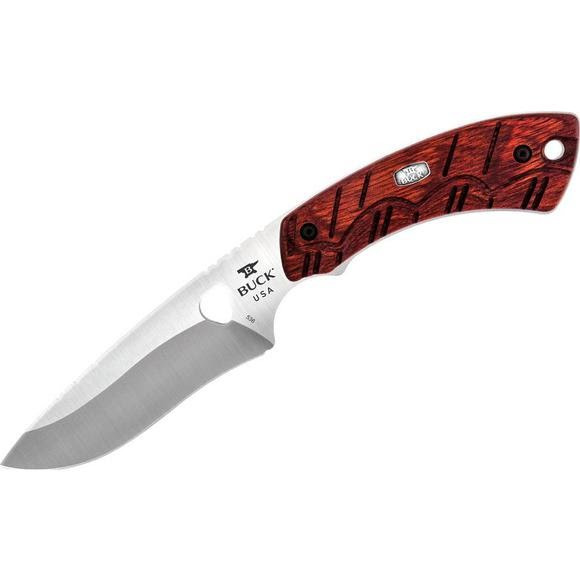 Features include a drop point, 4.5" blade with a large choil for a secure grip and finished with Buck&apos;s advanced Edge2x blade technology for unbelievable sharpness and blade retention out of the box. Comes with a black polyester sheath. Made in the USA.